Meanwhile, in large bowl, combine all remaining ingredients except mixed greens. 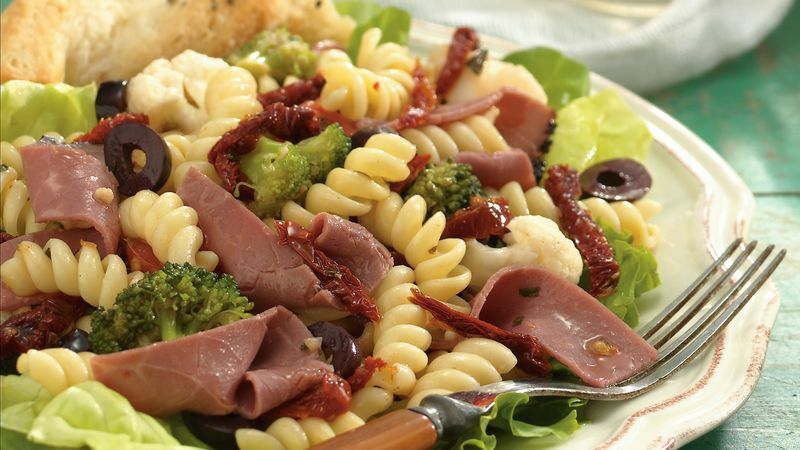 Add rotini to salad; toss to coat. If desired, add additional liquid from tomatoes or a small amount of olive oil. Serve over mixed greens. Medium pasta shells or gemelli, twin short noodles twisted together, can be used in place of the rotini. Pastrami in place of roast beef gives the salad a peppery bite. For a warm bread accompaniment, bake Pillsbury® Refrigerated Breadsticks. And, for a refreshing beverage, try white grape juice.